Learning how to strengthen, stabilize, stretch and soften the pelvic floor is essential to create the correct foundation for each movement in the body. In this online yoga course, Leslie Howard explores ways to develop a strong pelvic floor and discuss why it is important to keep the pelvic and abdominal organs healthy as we age to avoid women’s health issues like incontinence and prolapse. 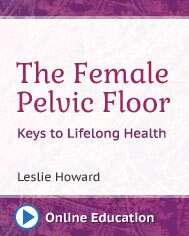 Leslie also discusses why a strong pelvic floor isn’t enough, we must also keep this important part of the body flexible. She discusses why developing and maintaining a healthy and strong pelvic floor involves a lot more than just doing Kegel exercises and demystify mula bandha. These practices are undertaught, misunderstood and if done improperly can lead to more problems.